My maternal second great grandmother Anna (or Annie as she was called) has languished in my family tree for ages without a maiden name or any parents or siblings. Recently, when I was trying to find out more about her husband William Liming, I decided it was time that I looked for Annie's family. The 1870 U.S. Census for Philadelphia showing Annie and William Liming living with Henrietta Simpson. 1880 U.S. Census for Philadelphia for Henrietta Simpson and Annie Liming showing that Annie is listed as Henrietta's sister. I searched the historic newspapers on GenealogyBank.com and found what I thought might be a clue to Annie's maiden name. In her death notice in the January 7, 1889, issue of the Philadelphia Inquirer her middle initial is given as "M." Henrietta Simpson's death notice also gives her middle initial as "M."
My aunt mentioned to me a year or so ago that she'd been told that we are related somehow to Robert Morris, the Revolutionary War financier. Could Annie's and Henrietta's middle initials be for Morris? Baptismal Record for Anna Liming. It lists her parents as Joseph and Sarah Morris, her birth date as December 28, 1809, and baptismal date as January 26, 1870. Baptismal Record for Henrietta Simpson. It lists her parents as Joseph and Sarah Morris, her birth date as January 8, 1808, and her baptismal date as January 26, 1870. In the 1850 Philadelphia census for Henrietta and her husband William Simpson, Isabella Finlayson and her daughter also named Isabella Finlayson are living with them, as well as Annie Liming's daughter Henrietta. I wonder if Isabella could be a sister, because Annie named one of her daughters Isabella (my great grandmother). The 1850 Philadelphia census for William and Henrietta Simpson, Henrietta Liming, and Isabella Finlayson and her daughter also named Isabella Finlayson. Birthplaces for Annie and Henrietta are listed as New Jersey or Pennsylvania in census records. The 1880 census notes that their parents were born in New Jersey. Isabella Finlayson's birthplace is listed as Scotland in the 1850 U.S. census (see above). I found a death notice for an Isabella M. Finlayson (see below). This is probably the same person as above as I found her death certificate at familysearch.org which lists her birthplace as Scotland in 1803. Unfortunately, Pennsylvania death certificates only list the parents if the deceased is a minor. I looked at the naming patterns of Annie's children for clues. I can guess where some of their names came from: Sarah (after her mother? ), Henrietta (probably after her sister), Isabella (after a sister? ), and Joseph (after her father Joseph Morris?). Other children are William (probably after her husband), John, Anna (probably after herself), Helen, and George. 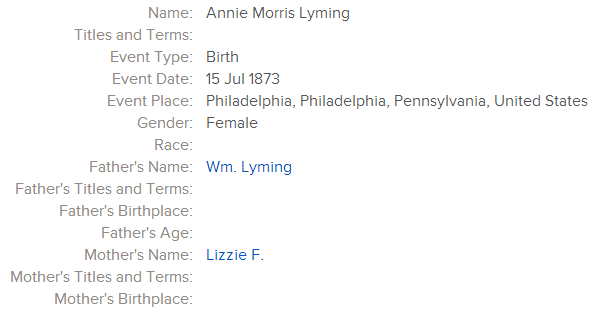 Annie's son William named one of his daughters Annie Morris Liming (spelled Lyming in the index below). This could be another clue that Annie's maiden name was Morris. It was not the maiden name of William's wife. 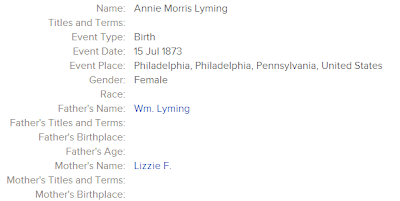 Index of birth record for Annie Morris Liming, daughter of William Liming and granddaughter of Annie M. Liming. Available evidence found thus far suggests that Annie's parents were Joseph and Sarah Morris, and Henrietta M. Simpson was Annie's sister. I've not found anything yet about whether or not Isabella is another sibling. I also haven't found a connection to Revolutionary War financier Robert Morris. I did find a Robert Morris family tree on ancestry.com that lists a daughter named Henrietta as one of his children, and that same tree lists one of Robert's brothers as Joseph who died in Pennsylvania in 1788. Could this Robert Morris line be from where the names of Annie's father Joseph and her sister Henrietta came? I'll continue my research on Annie, but the next thing I need to do is write up a research plan for Joseph Morris! 1870 U. S. census, Philadelphia County, Pennsylvania, population schedule, Philadelphia, p. 8, dwelling 61, family 69, Annie Liming, digital image, Ancestry.com (http://www.ancestry.com : accessed 13 May 2013), citing NARA microfilm publication M593. 1880 U. S. census, Philadelphia County, Pennsylvania, population schedule, Philadelphia, p. 3, dwelling 21, family 22, Annie Liming, digital image, Ancestry.com (http://www.ancestry.com : accessed 13 May 2013), citing NARA microfilm publication T9. "Died." Death notice for Annie M. Liming, Philadelphia Inquirer, 7 January 1889, online archives (www.genealogybank.com : accessed 12 December 2012), p. 3. Death notice for Henrietta M. Simpson, Philadelphia Inquirer, 17 April 1890, online archives (www.genealogybank.com: accessed 6 March 2013), p. 5. St. Andrews Episcopal Church (Philadelphia, Pennsylvania), Baptism, unnumbered page, Anna Liming, 26 January 1870; digital image, Pennsylvania Church and Town Records, 1708-1985 (www.ancestry.com : accessed 27 April 2013). St. Andrews Episcopal Church (Philadelphia, Pennsylvania), Baptism, unnumbered page, Henrietta Simpson, 26 January 1870; digital image, Pennsylvania Church and Town Records, 1708-1985 (www.ancestry.com : accessed 27 April 2013). 1850 U. S. census, Philadelphia County, Pennsylvania, population schedule, Philadelphia, p. 28, dwelling 133, family 187, Henrietta Simpson, digital image, Ancestry.com (http://www.ancestry.com : accessed 13 May 2013), citing NARA microfilm publication M432. Death notice for Isabella M. Finlayson, Philadelphia Inquirer, 23 March 1868, online archives (www.genealogybank.com: accessed 6 March 2013), p. 5. "Pennsylvania, Philadelphia City Births, 1860-1906" index and images. Database. FamilySearch, (https://familysearch.org/pal:/MM9.1.1/V1M5-MWC : accessed 13 May 2013). Annie Morris Lyming, 1873. This was such fun to read! You use the concept of naming patterns, along with your aunt's mention of Robert Morris, to take you to a whole set of new hypotheses. Great story of an investigation. You've probably already looked at that book about Robert Morris . . . does it mention family at all? Are there any local histories about the Morris family? Looking forward to what you do next. Google Books is great. They even told me which library the book I wanted was in. (University of SC in Columbia -- and we were traveling there anyway.) Couldn't get the book here in CT through amazon or ILL (which usually works), but there it was in SC -- the entire tree of my Crofts ancestors. So I paid to have the tree pages copied. Good luck hunting!